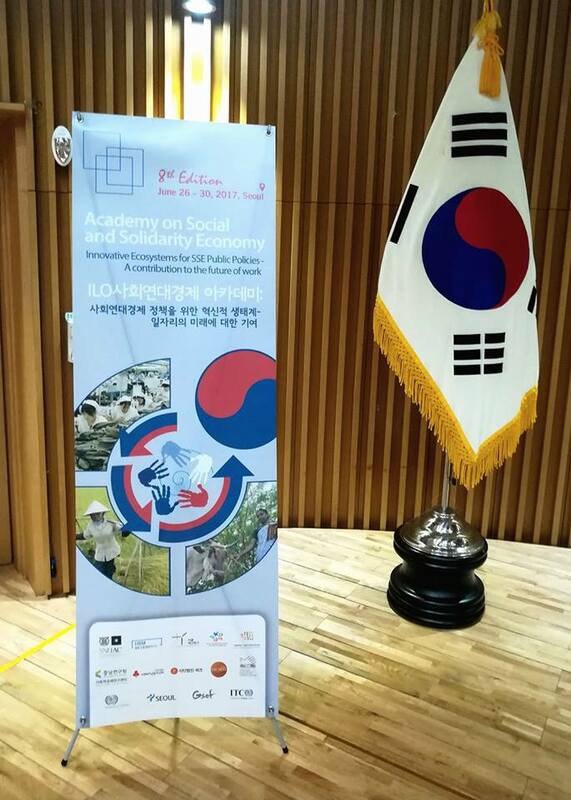 For the first time, UCLG contributed to the International Labour Organisation Academy on Social and Solidarity Economy public policies, which its 8th edition was held in Seoul, Republic of Korea, from 26th to 30th June. Known as the ILO Social and Solidarity Economy Academy, this inter-regional training event gathered around 200 practitioners and policy-makers from around the world, to share their experiences and meet leading Social and Ssolidarity Economy (SSE) specialists. In its 8th edition, the SSE Academy had a special focus on “SSE ecosystems and the future of work”. Today, the Social and Solidarity Economy is a reality in daily local lives as it promotes values and principles that focus on people’s needs and on their communities. During the Academy, participants defined Social and Solidarity Economy as an emerging, consolidating, alternative and complementary social model that seeks to balance economic success with fairness and social justice, from the local level to the global level. The meeting was the occasion for UCLG to share and promote its peer-to-peer learning activities in the context of SDGs localisation, and bring a refreshed vision on city-to-city cooperation experiences focused on local economic development, urban-rural linkages, informality and street vendors, targeted to South-South and triangular cooperation. During the 2 days elective course on City-to-City Cooperation applied to Social and Solidarity Economy, UCLG shared the peer-to-peer learning experiences of the cities of Maputo (Mozambique) and Durban (South Africa) on the reinforcement of the organizational capacity of food vendors, supported by ILO; as well as the South-South cooperation between Chefchaouen (Morocco), Bourgou (Benin) and Pasto (Colombia) on the production and consumption of food products and decent work in urban-rural areas. The main partners of this edition were the Metropolitan Government of Seoul, the Global Social Economy Forum (GSEF), the Seoul National University Asia Center, the Seoul Social Economy Center, the Seoul Innovation Park, the Chungnam Institute Research Center for Social Economy, the Korea Social Enterprise Promotion Agency, the International Labour Organisation and the International Training Centre of the ILO.